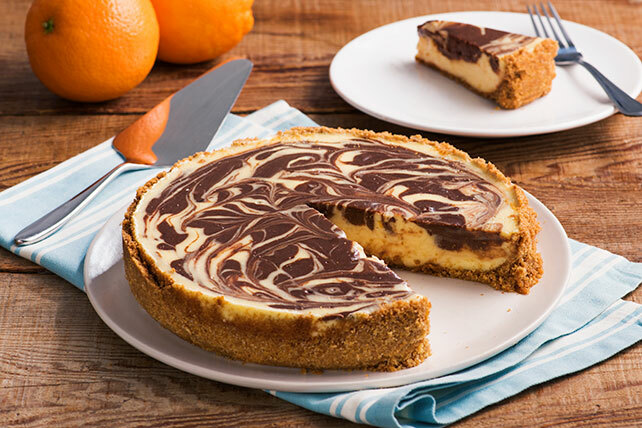 Orange peel and orange-flavored liqueur add refreshing citrus flavor to this luscious cheesecake swirled with streaks of bittersweet chocolate. Preheat oven to 325°F if using a silver 9-inch springform pan (or to 300°F if using a dark nonstick 9-inch springform pan). Mix crumbs, 1/4 cup of the sugar and butter; press firmly onto bottom and 1-1/2 inches up side of pan. Bake 10 minutes. Beat cream cheese and remaining 1 cup sugar in large bowl with electric mixer on medium speed until well blended. Add eggs, 1 at a time, beating on low speed after each addition just until blended. Add liqueur and zest; mix well. Remove 2 cups of the batter; place in medium bowl. Add melted chocolate; mix well. Pour remaining batter over crust. Drop spoonfuls of the chocolate batter over plain batter. Cut through batters with knife several times for marble effect. Bake 55 minutes to 1 hour or until center is almost set. Run small knife or metal spatula around rim of pan to loosen cake; cool before removing rim of pan. Refrigerate 4 hours or overnight. Store leftover cheesecake in refrigerator. Substitute orange juice for the orange liqueur.